Impassioned debate over secondary suite reform concluded Tuesday with a 9-6 vote by city councillors to approve a contentious first reading of a land use bylaw for Wards 7, 8, 9, and 11 aimed at streamlining the approval process by creating supplemental rental units. Both sides dug their heels in for a 10-hour clash at city hall between conservative assumptions and whimsical reasoning on the issue of re-zoning low-density areas in the city’s four core districts. This decision will affect 83 communities. 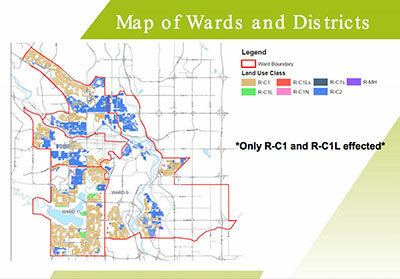 Map of low-density areas in Wards 7, 8, 9, and 11 presented to council by City Wide Policy and Integration are targets of new secondary suite reform approval to Bylaw 14P2015. While council awaits three more reports after producing amendments to the bylaw, since the council last dealt with the issue in December, the legalization of secondary suites in Calgary is farther ahead than ever. But the same pressing issues regarding clarity and muddled public knowledge surround secondary suite reform as council steers the discussion forward. The three reports promise the key to a more congruent council vote June 29 when second and third readings of the bylaw will be considered. This new bylaw approved for first reading had city council tossing and turning, as councillors carefully placed their votes in a long-drawn debate indicative of thought and care, or confusion. But council was able to arrive at a compromise despite the complexity and time dedicated to reach this balance between the two sides. Since December, city administration has contributed four staff members to tackling the requested bylaw amendments. These individuals have dedicated 165 hours of work with the support of over $150,000 to this project. This effort culminated in yesterday’s decision. Mark Erickson and Matthew Kennedy shared their vision with council, on Thursday May 12 for a more diversified inner city community. This mock up for futuristic laneway houses mirrors forward planning initiatives dedicated to handling Calgary’s vast suburban sprawl. Photo courtesy of Studio North Inc. The proposed changes circumnavigate re-designation approval from council. By sidestepping this process, the Calgary Planning Commission hopes to expedite the time required for approval and entice landowners to re-designate their homes and basement suites. Without this step, homeowners are able to start the Development Permit and Building Permit processes immediately. Cliff de Jong, senior special projects officer at the City of Calgary, says suites built before 2007 only have to comply with Alberta Fire Code. He estimates that in order to meet these bylaws, it will cost older suite owners $10,000 to $15,000. This is 50 per cent less than Canada Mortgage and Housing Corporation’s approximations for the cost for installing a secondary suite. Cost is not the only reason illegal secondary suite owners remain in the shadows. Current Land Use and Development Permit processes discourage owners from filing re-designation applications, says de Jong. Only 568 suites have received approval over the past seven years, Coun. Chu says. There are currently 32,000 available secondary suites throughout the city, and of these 43 to 45 per cent reside in the four wards. Calgary Municipal Land Corporation estimates 16,000 illegal secondary suite units exist, although Mayor Naheed Nenshi and Coun. Druh Farrell believe the number actually exceeds 25,000. Coun. Diane Colley-Urquhart also questions the effectiveness of this pilot project in bringing illegal suites forward without the proper measures taken to research this issue. While Stanley is trying to get more suites legalized, he was unwilling to anticipate the number of owners of illegal suites that will apply. Coun. Sutherland highlights the confusion between suites being illegal due to zoning or safety concerns, and the negligence in not making this distinction clear. The misconceptions, myths and lack of clarity clouding the rhetoric around secondary suites impact the polarization between opponents and supporters. The opposition comments during the public hearing got off to a rocky start, while speakers used stereotypes to support their perspectives. Coun. Farrell followed this line of reasoning with matching sympathy. “There is a tremendous amount of myth out there on who is actually looking for these suites and who will be living in them,” she says. She refers to the broad cross-section of Calgarians applying for suites – A lot of which are intended for seniors rather than rental income. 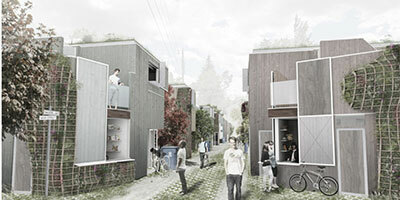 Young architects, Mark Erickson and Matthew Kennedy, owners of Studio North, a local design build practice, share their visions for a diversified inner city community. The pair is restoring Calgary’s historic Heritage House in Parkdale with the renovations of a Laneway home. They want to live in a human-centric community opposed to car-centric city. Linda MacFarlene, a senior Elbow Park resident, also shared her thoughts on the need for extended living spaces for the elderly, and the benefits discretionary suites offer Calgarians when it comes to the option for maintaining their independence between the nuclear family generations. But the longer secondary suite reform awaits approval, the longer vulnerable populations, like seniors, the homeless, students, new immigrant families, and single parents have to live in a tight rental market. “A lot of city councillors are more concerned with where we park our cars than where people are sleeping,” says Dennis Ram, chairman of the board of directors at SAIT’s students association. With Calgary’s population projected to grow by an average of 30,000 people per year, over the next five years, the issue of affordable and safe housing must be addressed. In 2014, 77 per cent of 605 Canadian municipalities permitted secondary suites. In Vancouver and Edmonton, secondary suites make up a fifth of the rental stock. With 55 per cent of first-time homebuyers purchasing single-family homes in the last two years, the metrics for secondary suite availability in the inner city low-density areas is a viable solution. Research is still needed to address the topics brought forth by councillors, administration and the public when council discusses the topic again on June 29.